A cabin of enjoyment. This beautifully decorated cabin in the Sierra Pines community is a twenty minute drive to the China Peak Ski resort and a five minute drive to one of the most picturesque lakes which offer abundant water activities. This brand new tri-level 2850 square foot, 6 bedroom, 4 bathroom has an amazing game room with a brand new Air Hockey table and two flat screen TV's with over 120 channels and a library of over 150 DVDs WIFI Internet Connection is also available. This home is professionally decorated with 2 king size beds and two queens. It has a beautiful deck to enjoy the mountain scenery and an outdoor BBQ. This cabin offers everything you will need for that very special ski trip or lake vacation. This luxury home features granite counter tops in the kitchen and bathrooms with stainless steel appliances, a stone gas fireplace, ceiling fans and a fabulous game room. This cabin has a two car garage and an extended driveway for boats and RV parking or 4 car parking. No other Sierra Pines Cabin offers this extra space for cars or boats!There are 2 king beds and 2 queens and 4 twin beds to sleep 12 people. The living room has a 42' screen TV with DVD player. The upstairs has 4 bedrooms and 2 full bathrooms. There is a master suite with granite counter tops and double vanity sinks and jacuzzi jet tub. The master suite has a walk in closet and vaulted pine ceilings with a ceiling fan. The main entry level has a fully stocked chef's kitchen, trash compactor and 2 bar stools. The dining room table seats 8 people comfortably. The living room has beautiful new leather sofas and a stone gas fireplace with a 42' flat screen TV and DVD player. The living room french doors open up to a beautiful deck overlooking the sierra trees and has a BBQ for outdoor dinning and beautiful patio furniture. The bottom level has a game room for entertaining. The kids and adults will enjoy this spacious room with air hockey, foosball, wii (bring your own controllers) and game cube for video games and a game table along with a 42' flat screen tv/dvd and sofa. When going on a vacation, your experience should be something special with all the extras and this cabin will provide a wonderful and comfortable vacation! This cabin is managed by the owner not a property management company so there are no hidden fees or processing fees!!!! Please see my website for more information. I bought this cabin because my son loves to snowboard and what a wonderful time we have had. We have had some of the best winters and love China Peak ski resort. It is old fashioned, simple, no lines but with great runs. Shaver Lake is very special in the summer at the Lake because you can swim, hike, bike or just hang out. Don't forget to try the Shaver Lake Chunky Bread! Yum. You will love our cabin and the kids will love the game room. The skiing at China Peak is wonderful - it is not a crowded resort so there is rarely a wait. You can also rent snow mobile's in Huntington. The lake during the summer is a real treat with lots of private beaches and great fishing! I have parking available for 4 cars -other Sierra Pines can only park 2 cars at the most. Best sledding right outside the cabin. Call the 805-674-1661 number during business hours for best rate. 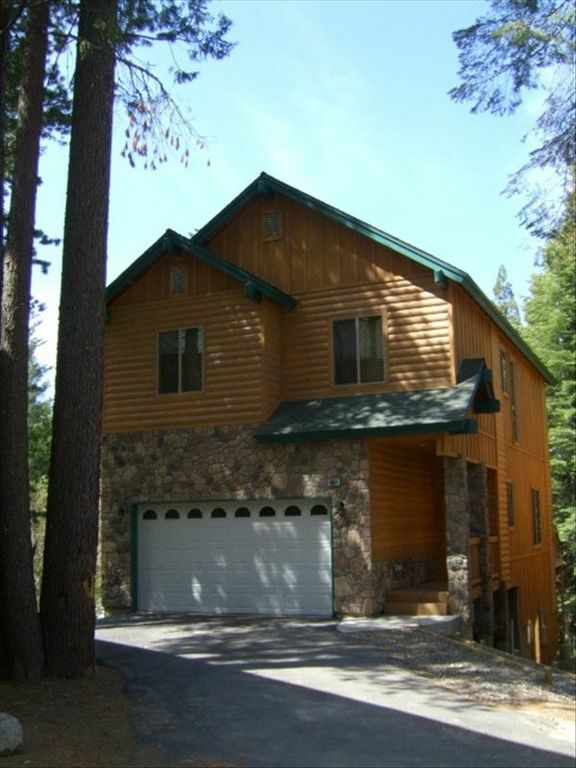 I manage the property privately so there is not a processing fee or open and close fee like the other Sierra Pines cabins which saves you money. waffle iron, blender, crock pot, etc. My family and I really loved the cabin we had so much room for the kids to play. It was a very comfy place to stay we felt right at home. Will be coming back soon. Slightly disappointed that the first ting we had to do was run to the local store to buy toilet paper and soap as there are none provided by the management company. When called the caretaker to ask if it was an oversight, I was told to read the fine print in the contract. Overall great time and will do it again. I think 3 stars is a brutal rating over toilet paper and soap. You were sent a welcome email several weeks before arrival with a list of what to bring and on that list is toilet paper etc. It is very common in Shaver for cabins not to supply toilet paper, paper towels and soap because it is difficult to stock with people taking home supplies upon their departure. I have kept my prices the same for the last 7 years because I try to manage the expenses. My housekeeper is not the caretaker and should only be contacted if you can't reach me the owner or if there is an emergency. I am sorry if her response was harsh but it was Christmas and toilet paper is not an emergency. Renting homes and cabins are not like a hotel, where there is someone available 24/7 so it is important to read the information and ask questions before you get there. I have families that come back year over year and in fact, you got the reservation due to a last minute cancellation and I am really disappointed with the very low rating that does not match other guests experience. Several old friends stayed here and it was great. Enough beds! Serviceable Kitchen. Easy to access entertainment. Beautiful deck. This condo was spacious and very effectively designed. The open concept main floor and downstairs game room gave us plenty of space to be together as a family. We loved that this condo had a view of trees from the kitchen window as well as the deck! Grocery stores, sporting goods, dining options, and lake access points were just minutes away. The owner was responsive and helpful throughout the booking process and our stay. We would definitely book this cabin again! We had a wonderful experience for a summer getaway at the cabin on labor day weekend. The cabin is spacious, clean, equipped, and has a great internal decor. Kids enjoyed the game room, watching movies on large screen TV. The lake is quite close by to shuttle back home should the plan change or you forget something. The patio is big with a nice overlook of wooded trees. Easy instructions to use the free internet connection. All in all it exceeded all our expectations and had everything promised on the website. I would definitely recommend this to families if Shave Lake is the summer destination. This place was absolutely what we where looking for, the kitchen is fully stalked with everything you can possibly need to cook your meals, beautifully decorated with tons of room, planning on returning and will recommend to family and friends. The owner was very nice and answered all my question! !